The publication 'Ballarat and Vicinity' wrote on Thomas Bath, 'Here lives Mr. Thos. Bath, one of our oldest and most respected colonists. Born at St Clements near Truro, Cornwall, he entered a seafaring life in 1846. He landed at Geelong in 1849, and moved to Buninyong in 1851. In 1854 Bath obtained Ballarat's first publican's licence, and opened the Ballarat Hotel (now Craig's Hotel), selling it to Walter Craig in 1857, and leaving to pursue farming at Learmonth.' Thomas Bath was a member of the Ballarat School of Mines (SMB) Council from 1889 until his death at Ballarat on 29 July 1901. The 'substantial sum' was used to build an engineering laboratory. SMB Council minutes of 8 November 1901 record that:- Plans for [the] proposed building were submitted ... and ... it was resolved that a temporary building for an engineering laboratory be put up.' This laboratory, as an existing building, is first mentioned in SMB President's Annual Report of 1901, presented on 28 February 1902, reporting 'the erection of a building 67 ft long by 33 ft wide' This report also lists all the equipment that would be accommodated in the engineering laboratory, including the experimental steam engine and boiler. The experimental Davey-Paxman steam engine arrived in Ballarat towards the end of 1902. The engineering laboratory was opened on 14 August 1903 by His Excellency Sir Sydenham Clarke. This engineering laboratory remained in use till about 1945. By 1944 preparations were under way at SMB to expand existing facilities, to be ready for the influx of returned soldiers. A new heat engines laboratory was built, this time of brick construction, replacing the previous corrugated-iron shed. 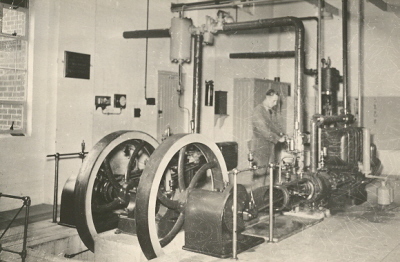 The steam engine was moved to the Mt Helen Campus in where it remains today. Image caption (RHS): Plaque acknowledging the Thomas Bath bequest.